This one’s too dramatically juicy to ignore. Poor Mary Miles Minter — was there ever a Hollywood life more pathetic, or more completely ignored by posterity? She once seemed to be the heiress apparent to Mary Pickford, yet Pickford is still a household name nearly 80 years after her last movie, while Minter… I suppose it doesn’t help that only six of Minter’s 54 movies are said to survive. But Minter’s obscurity isn’t merely a function of poor film preservation. It was her off-screen life that doomed her to an addled oblivion and a lonely death at the age of 82 — and her off-screen life was something she never had a moment’s control over. Poor Mary Miles Minter. 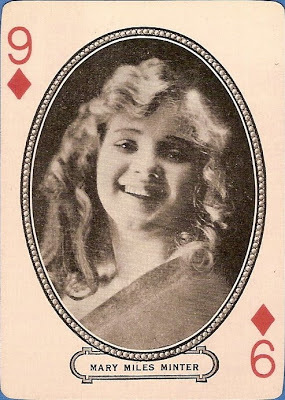 As I said before, Minter is the only person to appear at the 9 of Diamonds in any extant version of the M.J. Moriarty deck of cards, so presumably the happily smiling lass we see on the card is Mary as she looked in 1916, when she was only 14 years old. She looks more mature in the undated photo at right, less inclined to adolescent baby fat, though surely no more than 18 or 19. More melancholy, too — or is it just historical hindsight that makes me want to see a sadder-but-wiser girl? Poses like that are easy to find of Minter — wide-eyed, pensive, gazing soulfully to one side or the other of the camera, as if listening intently for something. Or to someone. It was a popular attitude for virginal waifs in those days, but in Mary’s case it might have had another motive: to make her look older. People look younger when they smile. For an illustration by contrast, here’s a postcard of Mary (probably from late 1922 or early ’23, near the end of her career) in which her smile looks quite open and unforced. There’s a certain dressing-up-in-Mama’s-clothes quality about this picture, isn’t there? That may not be too far from the truth. Minter’s mother was a real piece of work, a frustrated actress in the mold of stage mothers from time immemorial, who live out their own thwarted ambitions through their daughters — once they realize that that’s where the real talent in the family is. 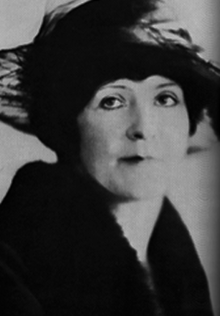 Mary Miles Minter was born Juliet Reilly on April Fool’s Day 1902 in Shreveport, Louisiana, the younger of two daughters of J. Homer and Lily Pearl Miles Reilly. By 1907 Homer was out of the picture, sent packing by Lily Pearl, who went gallivanting off to New York to be an actress, adopting the name Charlotte Shelby. Nobody knows why she chose that name; Sidney D. Kirkpatrick, in his book A Cast of Killers (more about that later), relays the speculation that a politician named Shelby might have helped Lily Pearl get her first big break. For whatever reason. Charlotte had left Juliet and her sister Margaret with their grandmother, but she soon sent for them to join her in New York, where little six-year-old Juliet caught the eye of Charles Frohman, producer of the play Charlotte was appearing in. Kirkpatrick says Frohman cast the tot in Cameo Kirby and A Fool There Was — but neither play was produced by Frohman, and Juliet Shelby doesn’t appear in either cast on the Internet Broadway Database. Well, whatever the exact names or titles involved, Charlotte realized in short order that little Juliet was the meal ticket. Juliet Shelby made at least one picture under that name in 1912, for Universal in New York: The Nurse (now lost, of course). Not long after that she caught the baleful eye of the Gerry Society, watchdogs over the exploitation of child labor and the bane of any show business troupe with underage players. Charlotte handled the matter creatively; she rushed back to Louisiana and borrowed the birth certificate — and name — of her sister’s daughter, who had died in 1905 at the age of eight. And hey presto! — eleven-year-old Juliet Shelby became sixteen-year-old Mary Miles Minter, old enough to satisfy the Gerry Society but looking young enough (because she was) to play the sort of roles for which she was in demand. By the time she made a hit on Broadway in Edward Peple’s The Littlest Rebel, she was Mary for good. This, in case you’re keeping track, makes the fourth name our girl had by the time she was eleven. Born Juliet Reilly, then Juliet Miles while she lived with her grandmother, then Juliet Shelby after joining her mother in New York, and finally Mary Miles Minter, a name and identity borrowed — stolen, really — from a dead cousin she never knew, yanking her once and for all out of any chance at a normal childhood. I leave the psychiatrists to speculate on what a history like that can do to a girl’s self-image. 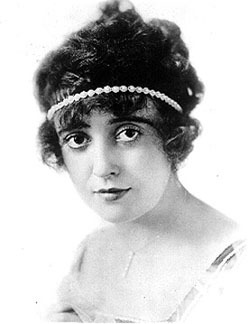 By the time she returned to pictures in 1915, this time on the West Coast for a succession of studios, she was an established stage name (although in true Hollywood fashion, her biggest hit, The Littlest Rebel, was filmed with somebody else, one Mimi Yvonne). “Of Littlest Rebel fame” followed her everywhere she went. Her heart was white as snow. Her mother had to go. 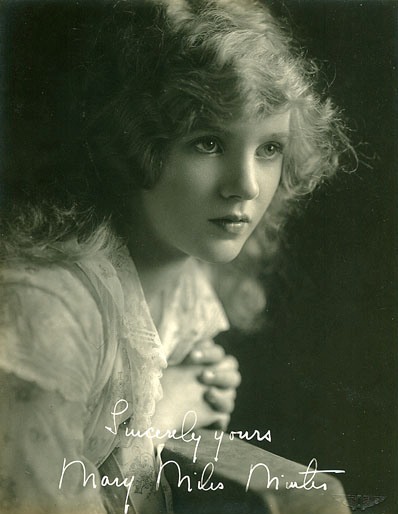 Actress Florence Vidor, as quoted by Sidney Kirkpatrick, remembered: “She and her mother were at each other’s throats from the day I met them. They fought about everything. But her mother always won. Mary was like Charlotte’s cute little puppet. I don’t think she ever cared about acting too much, really, but Charlotte wanted her to be a star, so Mary did what she was told.” Journalist Adela Rogers St. Johns said that Charlotte’s only career was “managing” Mary’s — at a 30 percent commission. She hired lawyers to find loopholes in whatever contracts she signed for Mary so she could shop for better deals at other studios. And she kept Mary hopping: Six pictures at Metro in 1915 and ’16, then ten at Mutual in ’16 and ’17, one more at Metro, then back to Mutual for nine more through July 1918, when Mary was still only 16. 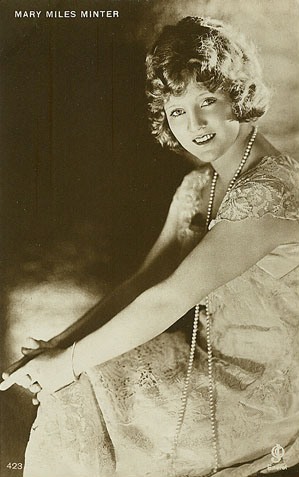 Then to Pathe for seven pictures in one year, topped off by Charlotte’s coup de grace in 1919: a million-dollar-plus contract with Paramount just as America’s Sweetheart Pickford was bailing on her Paramount contract for a sweeter deal with First National and, later, her own United Artists. Thirty-three pictures in 49 months; that’s a long resume for someone who “didn’t ever care about acting too much, really.” Maybe Mary’s heart wasn’t in the acting at that, but what else could she do? What else had she ever been allowed to do? She had to support the family in a style to which Charlotte was enjoying becoming accustomed. Charlotte and sister Margaret were actresses after a fashion, but the only parts they ever got were supporting roles in Mary’s pictures, suggesting that talent wasn’t a major factor in their casting. What effect further work with Taylor might have had we’ll never know, for after the release of Jenny Be Good in April 1920 they never worked together again. But there’s reason to believe — at least judging from Variety’s reviews — that he had a pivotal influence on her acting in those four pictures, all made in the year between her seventeenth and eighteenth birthdays. He may have had other effects on her as well, and that possibility came to light only after the evening of Wednesday, February 1, 1922. 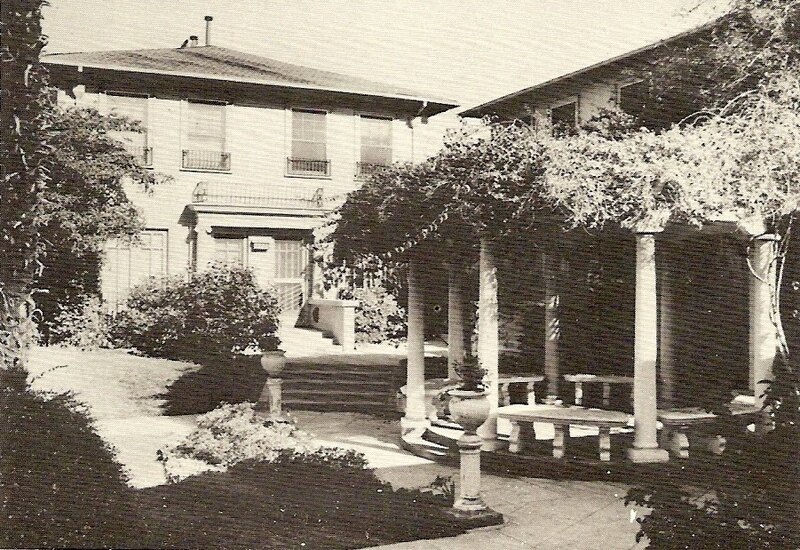 On that night, sometime after 7:45 p.m., in the living room of this bungalow at 404B Alvarado Street in Los Angeles, somebody stood behind William Desmond Taylor and shot him dead with a .38-caliber Smith & Wesson revolver. The murder came right smack in between Roscoe “Fatty” Arbuckle’s second and third trials, up in San Francisco, in the death of Virginia Rappe after a Labor Day party in Arbuckle’s suite at the St. Francis Hotel. And the press pounced on Taylor as they had on Arbuckle; here was more proof — as if any was needed — of the moral turpitude of Hollywood. Lurid stories circulated in the press as the investigation progressed. Most of them weren’t reflected in the official police files or those of a succession of Los Angeles district attorneys, but they were enough to ruin two careers. Not all of the stories weren’t true. For one thing, it developed that William Desmond Taylor wasn’t his real name. He was born William Cunningham Deane-Tanner in 1867, not 1877 as widely believed while he was alive. He had abandoned a wife and daughter in New York in 1908; his wife had divorced him in absentia, but she spotted him in one of his pictures as an actor, leading his daughter Daisy to seek to contact him. They had finally met in July 1921, and Tanner/Taylor promised to see her again; as things turned out, he never did. There was enough mystery in Taylor’s real life to feed plenty of rumors after his death. 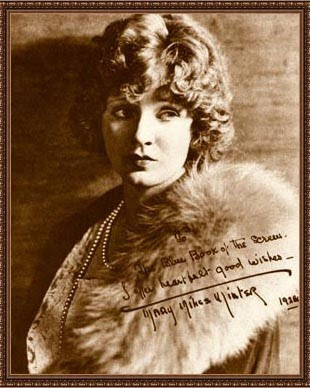 The other ruined career, of course, was Mary Miles Minter’s, and looking at her face in this picture she (or, more likely, Mama Charlotte) signed for the 1923 edition of Blue Book of the Screen, it’s impossible not to believe she knew the end was nigh. In the flurry of publicity after Taylor’s murder, all of her publicity was bad. Love letters surfaced, some in a kind of schoolgirl code, that she had written to Taylor — they look girlishly innocuous to modern eyes, but in 1922 they were scandalous, and not in keeping with the sugar-and-spice-and-everything-nice image Charlotte and her studios had so carefully cultivated. In Taylor’s bedroom dresser was found a sheer pink nightie embroidered with “MMM;” it was passed around police headquarters for a while, for laughs, before vanishing altogether. Were Minter and Taylor — 15 and 50, respectively, when they met in 1917 — lovers? Only two people ever knew the answer to that one, and they both died without saying. Florence Vidor, for one, didn’t believe Minter was sexually active with Taylor or anyone else. When would she have the chance, with Charlotte never letting her out of her sight? Some friends of Taylor’s believed Minter was infatuated with the director, badgering him with pleas for his affection when he regarded her as no more than a dear little child; other acquaintances believed that, well, Taylor had no interest in women of any age. Whatever the case, the damage was done. Even before the murder, the Hollywood establishment had begun to suspect that Mary Miles Minter’s time had all but passed; afterward, studios and the public at large regarded her almost as a has-been who wouldn’t go away. Reviews of her last picture, The Trail of the Lonesome Pine (released on April 15, 1923) were downright cruel. 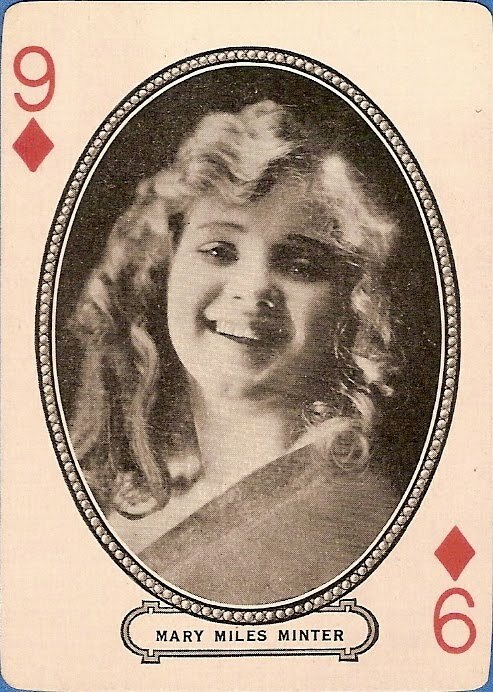 The New York Times: “The chubby Mary Miles Minter, who apparently does not often take as much exercise as in this production…” Variety wasn’t as unchivalrous as all that, but reviewer “Fred” dismissed her as “colorless.” Ten days later, Paramount bought out her contract for $350,000 and released her. She had just turned 21. 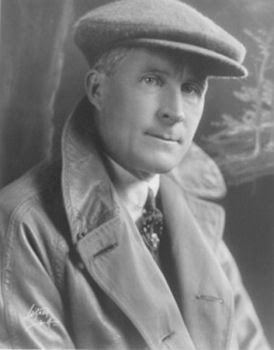 The murder of William Desmond Taylor was never officially solved, and it hung over Mary Miles Minter and her mother like a curse from beyond the grave. Eventually the two were driven to a public statement: the L.A. district attorney should put up or shut up; publish any evidence against them and charge them, or absolve them once and for all. The D.A.’s office replied that they had nothing, and absolved them. Over the years there’s been no shortage of theories. He was shot by a burglar. Or by Normand. Or one of her ex-lovers. Or a bootlegger to whom Taylor owed money. Or drug dealers, angered by his efforts to help Normand kick her habit and to have them driven out of town. Or a secretary who had disappeared after robbing Taylor and forging his signature to cash checks. Or, no kidding, the butler (one Henry Peavey) did it. 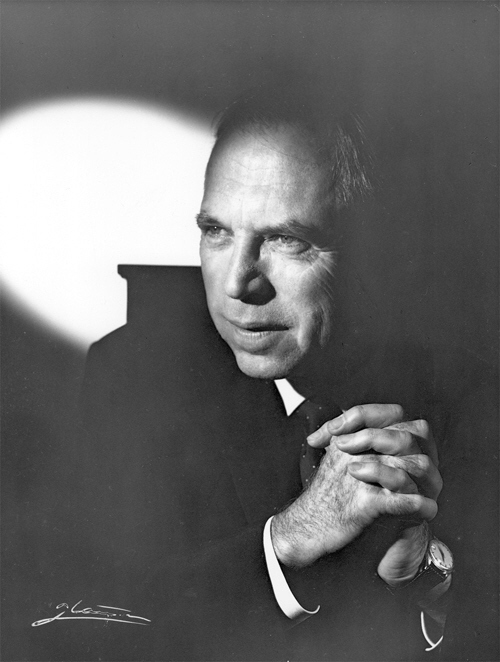 In 1967, 73-year-old director King Vidor, who had been a contemporary and acquaintance of Taylor’s, launched a personal investigation for a screenplay he hoped to write and direct. Many Hollywood old-timers were still alive then, and nearly all of them had their own take on the mystery. His efforts took him far and wide, visiting friends and former colleagues — including Mary Miles Minter herself. She was now living quietly in Santa Monica and answering only to Mrs. Brandon O’Hildebrandt, the name of the man she married in 1957, after Charlotte Shelby finally died. Her husband had died in 1965, leaving little Juliet Reilly a final name to fold herself into. Vidor never made that movie, or any other feature, though there was an unrelated documentary short in 1980. Solomon and Sheba in 1959 proved to be his final outing as a director. The fruits of his investigation were locked away in a strongbox in his garage, where they were discovered after Vidor’s death by his biographer Sidney D. Kirkpatrick. Kirkpatrick published the material in 1986, along with Vidor’s conclusions about the crime, as A Cast of Killers. I won’t mention Vidor’s solution to the mystery, because I happen to believe it’s the correct one. Kirkpatrick’s book, despite some minor inaccuracies and the annoying lack of an index for such a complicated tale, is a good read, and I wouldn’t care to spoil it. Juliet Reilly/Miles/Shelby/Mary Miles Minter/Mrs. Brandon O’Hildebrandt outlived King Vidor by nearly two years. Mentally fragile as she may have been, she was reasonably well-fixed thanks to real estate investments during the glory days. But her Santa Monica neighborhood grew perilous, and she was robbed more than once. During one robbery in 1981 she was bound, gagged, beaten and left for dead; she survived, and an ex-servant was charged with the crime. She died on August 4, 1984, age 82; any thoughts she had after that 1967 visit from King Vidor she most likely took with her. 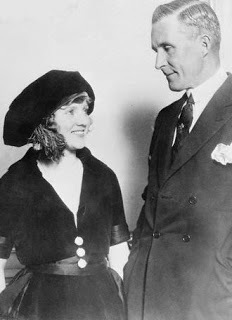 Mary Miles Minter has a star on the Hollywood Walk of Fame at 1724 Vine St., a little over five miles from the spot where William Desmond Taylor died. Going through a whole deck of cards should give you lots of material, if you ever get stuck for a posting! Yes, Lee, I've got plenty of names to work with. Unfortunately, these stars' presence in the deck is based on their popularity in pictures made between, say, 1911 and 1918 — approximately 95 percent of which are now lost forever, with maybe another three or four percent squirreled away in climate-controlled archives and (for commercial purposes) not worth issuing on video. So I'm left to comb through the archives of Variety and the New York Times for reviews, seeking some sense of the careers they had. Thanks for asking, Anon, and thanks for stopping by; hope you'll return often. Altogether, including research time, I worked about a week on this post.